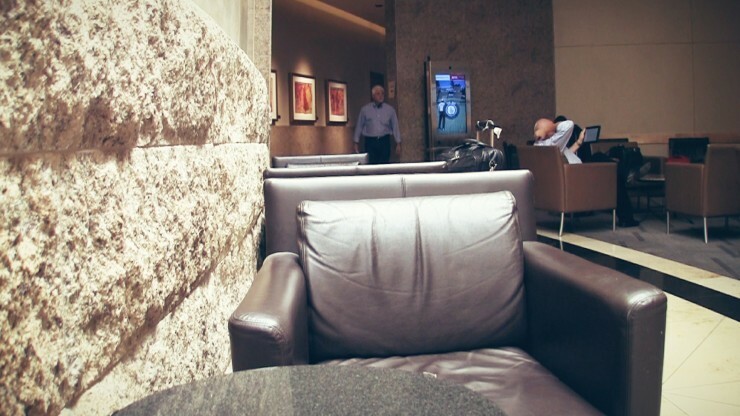 With the Terminal A American Airlines Admirals Club DFW has itself a domestic lounge winner. Seating: Some of the seating arrangements are nicely situated, others are just silly here at the Terminal A American Airlines Admirals Club DFW. Most seats though are plenty comfortable with typical 2000’s era deep loungers and some thinner, armrest-free chairs scattered in the main parts of the lounge. Outlets aren’t hard to find but seats are easy at the American Airlines Admirals Club DFW at Terminal A.
What’s great is that there are different rooms throughout the space sporting different arrangements suited for different types of travelers from solo to group. We missed it, but it seems there’s even a “secret” room offering even more room to spread out. Food/Drink: The free options here for food are just slightly above average for a domestic lounge. On our visit, hot soup was offered alongside cubed cheese, olives, fruits and snack-size veggies. Boozy and soft drinks at the Terminal A Admirals Club DFW are served at the staffed bar, as is the case inside all Admirals Club DFW locations (Terminals A/B/C/D). Premium food is offered and can be ordered for purchase and include breakfast sandwiches and more savory items in the afternoon/evening. Wi-fi/Connectivity: It’s a big lounge but wi-fi worked well in each spot we tested. Power outlets were a little harder to find but we’re told this A Terminal Admirals Club DFW location is less crowded than it used to be when it handled international arrivals. With those operatons moved to the D Terminal your chances of finding a seat next to an outlet aren’t that bad. It’s our favorite kind of cheese: Unrefridgerated. Cubes and crackers at American Airlines Admirals Club DFW at Terminal A. Service: Admirals Club front desk staff was very friendly. The agent had a tough time finding our day pass in the system but eventually concluded that the agent at Newark hadn’t entered it into the system correctly. He happily cleared it up quickly and welcomed us into the lounge. Showers: There are showers attached to the lounge fitness center. Yes, there’s a fitness center. Summary: This might be the best Admirals Club DFW has to offer where space is concerned. Built to handle the much larger crowds an international terminal serves up, it’s now a spacious oasis for domestic passengers. Friendly service and just slightly better than standard food offerings (we like cookies), make this is a pretty nice domestic lounge. How to get in: We got in using a US Airways day pass that came with the now defunct US Airways Mastercard. Unfortunately, that yearly benefit isn’t a part of the Barclay’s issued American Airlines Aviator card post US/AA merger. If you’re not a regular Admirals Club visitor and just can’t take the gate chaos on a long delay, your best bet might be to pony up for a day-pass ($50 at time of this post). The Citi AA Executive World Elite Mastercard gets you in for free…if you’re not counting it’s hefty annual fee. I like the Terminal A club and have been there many times. It’s one of the few or maybe the only places inside security at DFW that you can still smoke since they remodeled the AA club in D and took out the smoking area there. I would imagine they will remodel this lounge some day but I hope for others that they keep the smoking room. I don’t smoke but it’s a hassle for smokers to have to go through security just to smoke during a layover.